Another Beautiful Day in Paradise. It was 59 this AM but warmed up to the high 60s by the end of our Blade/Bicycle. Bladers/Bicyclers Carol J, Roy H, Steve G, Dimitri F, Rob H, Bruce M, Rob G and Dee T came. Welcome all. As the Trail South is not very smooth, we headed North up that nice and smooth Trail. We ended up in two groups. One group turned around at 4 miles for a 8 mile round trip. 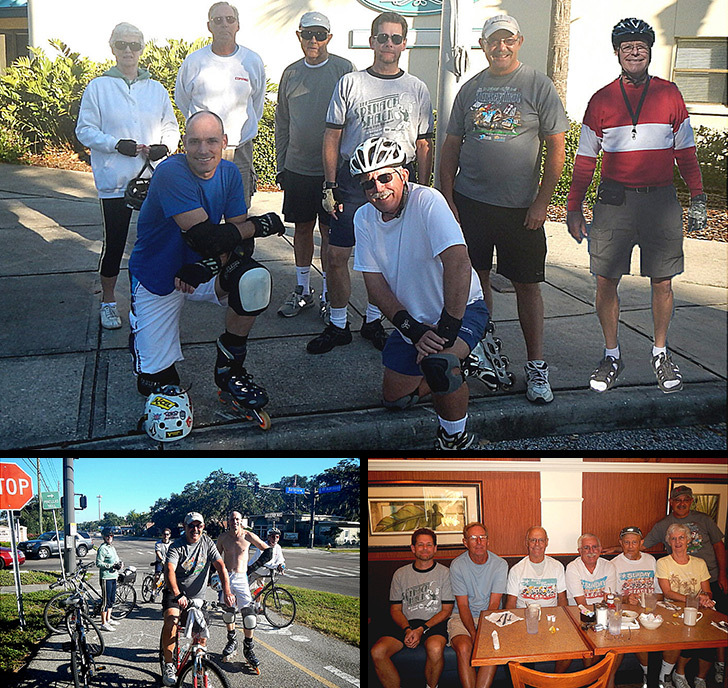 The other group went 7.5 miles North up to Belleview Rd in Clearwater for a 15 mile round trip. We had 2 bladers and 6 bicyclers. We Brunched at Mamas Kitchen as planned. Mamas Kitchen was very busy but we got in and seated within 10 minutes. Service was good and the coffee flowed fairly well. We got in and out within about 50 minutes. Brunch ratings were 9 to 9.5 so we'll give Mamas Kitchen a 9.3.